A new version of jailbreaking tool for iOS devices such as iPhone, iPad and iPod touch running iOS version 4.2.1 has been released by iPhone Dev Team. Redsn0w 0.9.7, currently in beta 4, is able to jailbreak iPhone 4, iPad, and iPod touch 4G running on iOS 4.2.1. Here’s the step-by-step instructions for untethered jailbreaking with Redsn0w 0.9.7b3 or Redsn0w 0.9.7b4. In order to use Redsn0w 0.9.7b3 or Redsn0w 0.9.7b4 to jailbreak iPhone, iPod touch or iPad, the device must have SHSH blobs saved for iOS 4.2 Beta 3, and has been upgraded to run iOS version 4.2.1. As currently Redsn0w 0.9.7b3 and Redsn0w 0.9.7b4 is only available for Mac OS X, a Macintosh system is obviously a must. Jailbreaker must have a copy of iOS 4.2 Beta 3 firmware software .ipsw file too. Note: Unlocker should not use the Redsn0w 0.9.7b4 or earlier for now. The trick also works to convert from tethered iOS 4.2.1 jailbreak to untethered iOS 4.2.1 jailbreak. Upgrade iPhone, iPad or iPod touch to official iOS 4.2.1 if not yet already done. Jailbreak the iOS device with Redsn0w 0.9.6b4. The jailbroken device will be tethered. Start Cydia and wait for it to completely load the main page. The top of the web page will show a line which starts with “SHSH:”. Verify that the SHSH blobs of iOS 4.2b3 is listed (saved). Download Redsn0w 0.9.7 and connect your iPhone, iPad or iPod touch with Mac. Note: Redsn0w 0.9.7b4 does not require this step. It’s only necessary if you’re using Redsn0w 0.9.7b3 or earlier. Start Redsn0w and point it to the official iOS 4.2.1 firmware file. 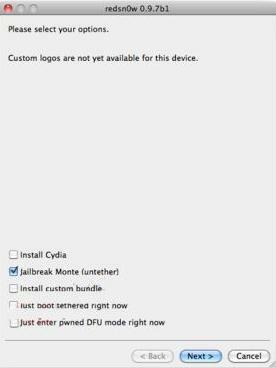 Click “Next” and then select “Jailbreak Monte” option, followed by selecting iOS 4.2 Beta 3 firmware file. 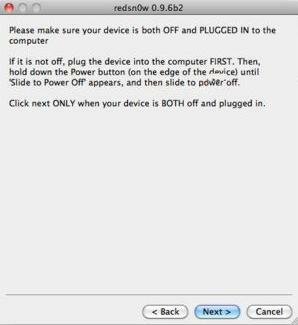 Ensure that the iOS device is OFF and plugged into the computer, then click “Next”. 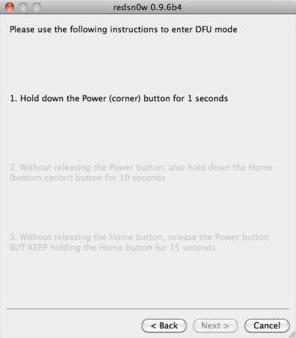 Enter DFU recovery mode by quickly press and hold the “Power” (Sleep/Wake) button on the iDevice, then simultaneously press and home “Home” button. After about 10 seconds, release “Power” (Sleep/Wake) button but keep pressing the “Home” button until installation starts. Redsn0w will automatically perform the necessary steps to jailbreak the iDevice. When done, the iDevice will automatically restart. The iPhone, iPod touch and iPad is now fully jailbreak untethered running latest iOS 4.2.1 OS software, which does not require to be connected to computer to re-jailbreak when rebooted.